I’m a total Pixar junkie, and have been since the early days of the company. (Remember Luxo Jr?) 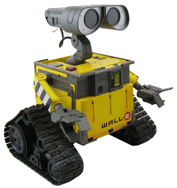 I just ran across this: Gearlog is reporting Disney/Pixar and Wowwee are going to release a Wall-E robot this summer for about $190! It’s going to have a remote control, be able avoid obstacles, touch detection, sound, 10 motors and will be programmable! Very cool! Can’t wait to see it! Looks like Pixar is going to do “Toy Story 3” – in 3-D! In fact, they’re going to convert “Toy Story” and “Toy Story 2” to 3-D as well. Pixar has long been a favorite company of mine, and I’ve been a fan since long before “Toy Story” came out. I was able to see John Lasseter lecture at Siggraph in 1994, and was able to speak with Ralph Eggleston at first Automous Agents conference in 1997. He gave a speech where he spoke about the technology they were developing to control the ants in “A Bugs Life”. I asked him a few questions afterwards, and when I gave him a business card, he noticed that the web site I had at the time was named “lightyear” (after Buzz, of course). That was when I was working on Mosaic. I had done a few 3D products before then, but didn’t start to do anything serious with 3D graphics until a few years later when I started working with Java 3D. Thanks to Andy for pointing me to the info about “Toy Story 3” via Ain’t It Cool News.